The UTEP Department of Theatre & Dance is proud to introduce this new version of Dickens' timeless masterpiece told in the spirit of la Frontera! This holiday ghost story is filled with thrills and chills to delight young and old alike. 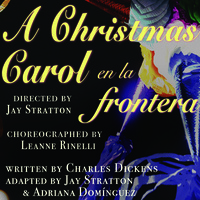 But more than yuletide specatcle, A Christmas Carol, en la Frontera is a tale of family, solitude and redemption, with the unique flavor of our unique region. Whether you are a lontime fan of the original or a theatre goer looking for something new, this production will fill you with hope and get you ready for the holiday season. Dec. 8 & 14 @ 7:30p.m. Dec. 8*, 9 & 16 @ 2:30p.m.